Two private rooms seating parties of 30 or 50 guests. Italian-themed. No room charge with food purchase. Small groups may order and pay individually at the front counter if desired. Close to downtown and the University of Nebraska. 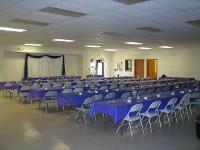 This facility consists of a large multi-purpose room that will seat up to 225 while leaving room for a dance floor or buffet table. There is a very large kitchen with warming ovens, a full-size refrigerator, microwave oven and an ice machine. Restrooms are nice and roomy. All areas are handicap accessible. The property also includes a children's playground, two sand volleyball courts, two softball fields for activities and a Picnic Shelter which provides seating for 40 and has electrical outlets. Alcohol is permitted. All suite hotel with hot continental breakfast, indoor pool, exercise facility, guest laundry facilities, in-room microwaves/fridges, iron and boards, hair dryers, coffee makers, cable TV, complimentary high-speed wireless internet and business center. Hyatt Place combines style and innovation to create a completely new hotel experience. An experience that offers an array of services and features designed to meet the evolving needs of today's travelers. Whatever your event, the Hyatt Place Lincoln/Downtown-Haymarket offers flexible catering services to meet your needs, featuring all-inclusive meeting packages, unique food and beverage options, and cutting edge A/V equipment and technology. Set against a stunning backdrop of hills, lakes and waterfalls, Wilderness Ridge is one of Nebraska's most exclusive facilities for conducting business and pleasure. The majestic log and stone clubhouse says it all from the hand-cut floors, walls and doors to the custom-made chandeliers and furnishings. The Lodge Restaurant offers a full menu and uses locally sourced resources whenever possible. The resort-style setting and exceptional service are truly unlike any in the area. From business luncheons and corporate golf outings, to weddings or other social gatherings, our outstanding staff can help you arrange an exceptional event.